VietNamNet Bridge – After lashing the Philippines, tropical storm Nock-Ten entered the East Sea yesterday evening with winds of 88-102 kilometer per hour and gusts of up to 132 kilometers per hour, the Central Hydro-meteorological Forecasting Center said. The powerful storm is moving west-northwest towards China’s Hainan Island at 20 kilometers an hour. At 10 pm today, the storm is expected to lie centered 440 kilometers east-northeast of Truong Sa (Spartly) Islands, packing winds of up to 102 kilometers. It will cause rough seas in the northern part of the East Sea. It will also bring thunderstorms, and possibly squalls, in the middle of the East Sea, including off Truong Sa (Spratly) Islands and the waters between Binh Thuan and Ca Mau Provinces. 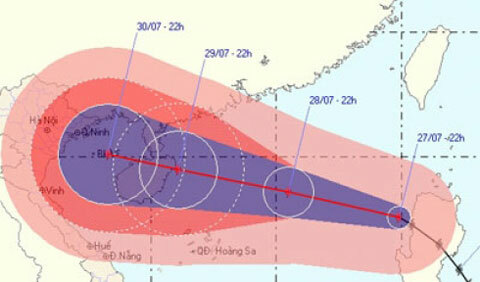 By 10 pm Friday it is expected reach close to Hainan, with winds of 117 kilometers and gusts of more than 132 kilometers. On Saturday or Sunday, Nock-Ten will enter the Tonkin Gulf, bringing heavy rains to northern and north-central Vietnam. Flashfloods may occur in some provinces, the center warned. At a meeting of the Steering Board for Flood and Storm Prevention and Control yesterday, Deputy Prime Minister Hoang Trung Hai urged relevant agencies and authorities in northern and north-central provinces to track the storm’s path and be prepared with contingency plans to minimize damage in case the storm makes landfall. He ordered the Ministry of Agriculture and Rural Development to examine the safety of dykes and reservoirs and protect newly planted rice fields. Local authorities must make plans to evacuate people from areas vulnerable to flashfloods, he said. Nearly 16,000 boats with more than 101,000 people on board in the sea between Quang Ninh and Quang Ngai Provinces have been informed about the storm’s movement, the Border Guard High Command reported. At least 20 people died and nine others were missing in the central Philippines yesterday following floods unleashed by the storm, Reuters reported. The storm, with winds of up to 120 kilometers per hour, disrupted flights, ferries, and schools in the region and caused more than 650,000 people to be evacuated from their homes to safe places.